volume in shipping traffic entering North Korea from China has declined in the wake of intensifying international sanctions. 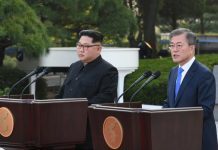 South Korean envoys representing the Moon administration met with North Korean leader Kim Jong Un in Pyongyang on February 5 amidst what appears to be an accelerating campaign by the North to achieve sanctions relief. Supporters of sanctions are in turn arguing that the North’s renewed outreach is proof that the measures are eroding the power of the Kim Jong Un government. In 2017 alone, the United Nations Security Council passed four major sanctions resolutions against North Korea: Resolutions 2356, 2371, 2375, and 2397. Under the measures, the North’s crude oil imports were restricted, and coal and mineral exports were banned. Additionally, the North was prohibited from sending its laborers to work abroad – one of the key ways in which the regime earns foreign currency. Other experts support the opinion that sanctions are working against the North’s overall trade. 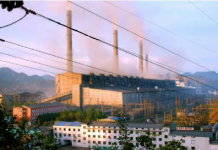 “North Korea’s exports to China are down 37%, which has led to a further 1.8% drop in growth for the North’s economy over the last year,” said Kim Byung Yeon, a professor at the Department of Economics at Seoul National University. 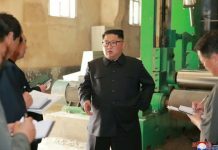 “If the North is unable to get sanctions lifted, the growth rate for their economy could drop to as low as minus 5% in the next year,” Kim added, explaining that the effects on economic growth will be significant due to the structure of the North’s economy and the relatively high proportion that exports contribute to it. But while sanctions appear to be having a significant effect on the North’s trade and industry, experts are noting that the local markets in the country have not been affected as heavily. “When you look at the price of rice or the exchange rate over time, it’s hard to see any major effect of sanctions (on local markets),” KIET researcher Lee said. Daily NK’s own research has come to the same conclusion, finding that the price of rice in North Korea’s markets has remained steady at around 4,000 to 5,000 KPW per kg since the beginning of the recent surge in international sanctions. “People have been relying on themselves, actively participating in the markets and smuggling since the end of the Arduous March (great famine of the 1990s), which means that sanctions do not yet seem to be having an effect on the markets,” said a source in North Hamgyong Province, pointing to the steady availability of consumer goods as evidence.